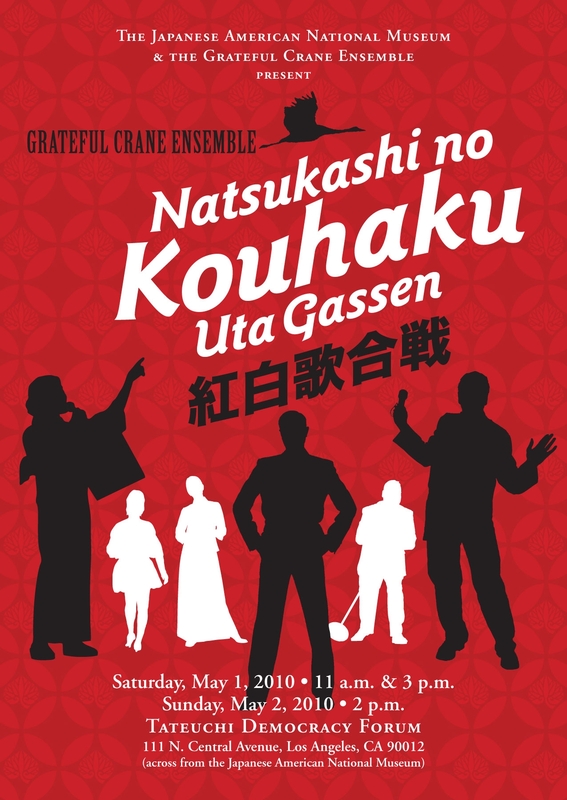 May 1-2 — Nostalgic Japanese enka songs and entertaining impressions of famous Japanese singers will be featured at “Natsukashi no Kouhaku Uta Gassen,” on Saturday, May 1 at 11 a.m. and 3 p.m. at the Tateuchi Democracy Forum in Little Tokyo, downtown Los Angeles. The Sunday show at 2 p.m. is sold out. partnership with JANM at the Tateuchi Democracy Forum. Directed by Keiko Kawashima with sound by Scott Nagatani, the two-act show pits the Red Team (Women) vs. the White Team (Men) in a battle of the sexes singing duel, with the audience deciding the winner at the end of the show. 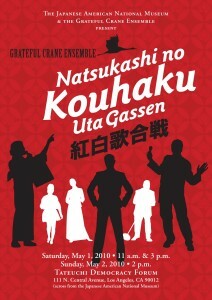 Famous songs by Misora Hibari, Itsuki Hiroshi, Yamaguchi Momoe, Saijo Hideki, Go Hiromi, Nakamura Mitsuko and Mikawa Kenichi will be presented, along with modern-day tunes by Natsukawa Rimi, Jero and SMAP. Featured in the show’s cast include Aaron Aoki, Loryce Hashimoto, Haruye Ioka, Keiko Kawashima, Hideo Kimura, Darrell Kunitomi, Kurt Kuniyoshi, Aimee Machida, Merv Maruyama, Junko Nakamura, Helen Ota, Shaun Shimoda and Fusako Shiotani.